I know some of us has done their holiday shopping since last year's Black Friday or January first. For the rest of us waiting for the last minute either by choice or just waiting on that last check before the Holidays. 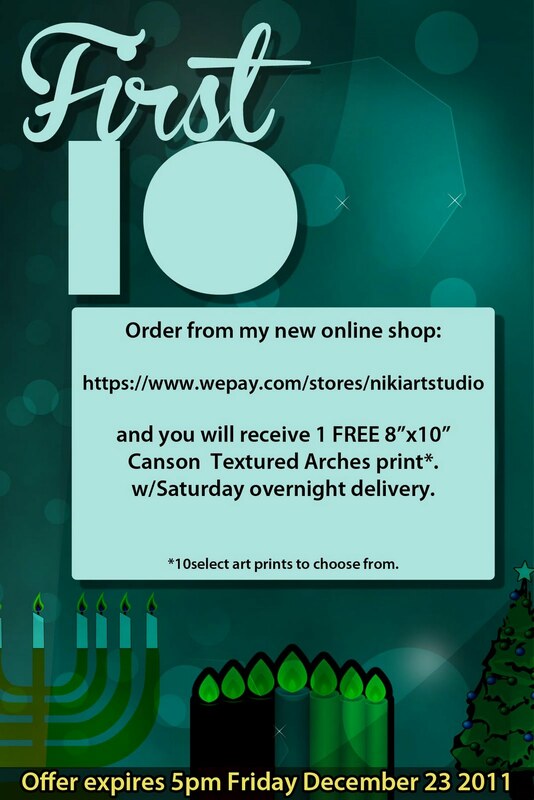 I am offering one FREE print of your choosing (from 10 selected artworks). This is archival textured Arches paper. Ready to be framed and hung! If you are still attempting delivery for Christmas, my cut off is 5pm Friday December 23 2011 and be sure to add Saturday Overnight delivery. Very nicely set up Niki! Are they all the same size prints? Just asking from a collectors point of view...Good job! Awesome work! Yes Christine, the 10 FREE prints are all 8.5"x11". The art work for purchase vary in sizes and they are listed in the description.